There are two main ways to get to Cat Mountain. If you choose to do it after hiking Golden Gate Mountain, continue down the Gates Pass road to the west and turn left on Kinney Road. 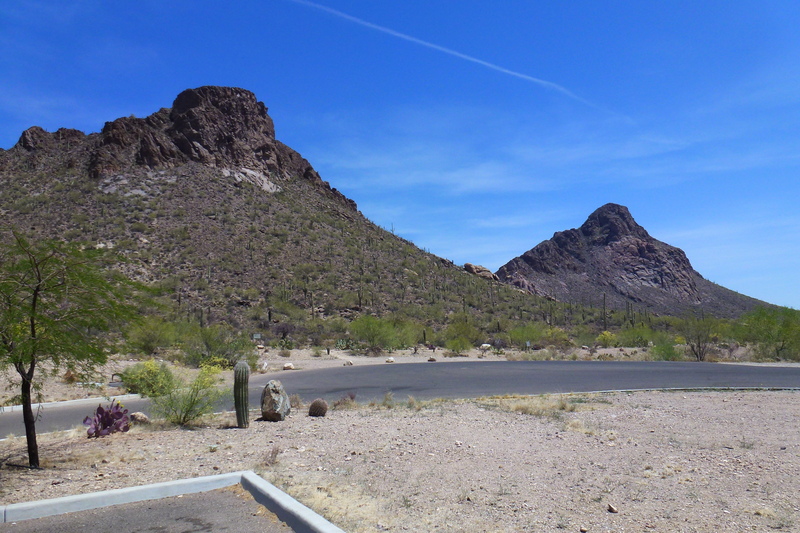 After you pass Tucson Estates, turn left on Sarasota Boulevard and drive up this to the Sarasota Trailhead at the end. 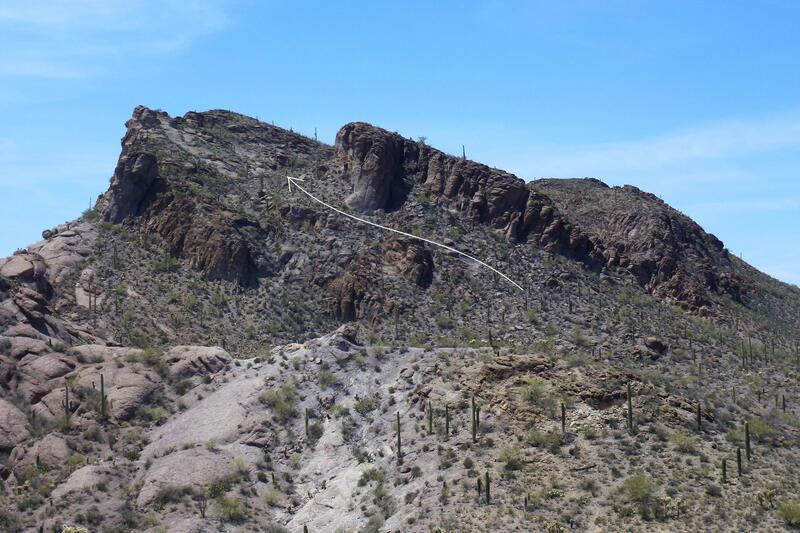 The quicker way from Tucson is to head west on the Ajo Highway (Highway 86) then turn right on Kinney Road. After about 0.8 miles turn right on Sarasota Boulevard and drive up this to the Sarasota Trailhead at the end. The view from Sarasota Trailhead. Little Cat Mountain on the left, Cat Mountain on the right. The hike takes the left skyline ridge up Cat Mountain. From the trailhead, walk right under the cliffs of Little Cat Mountain. 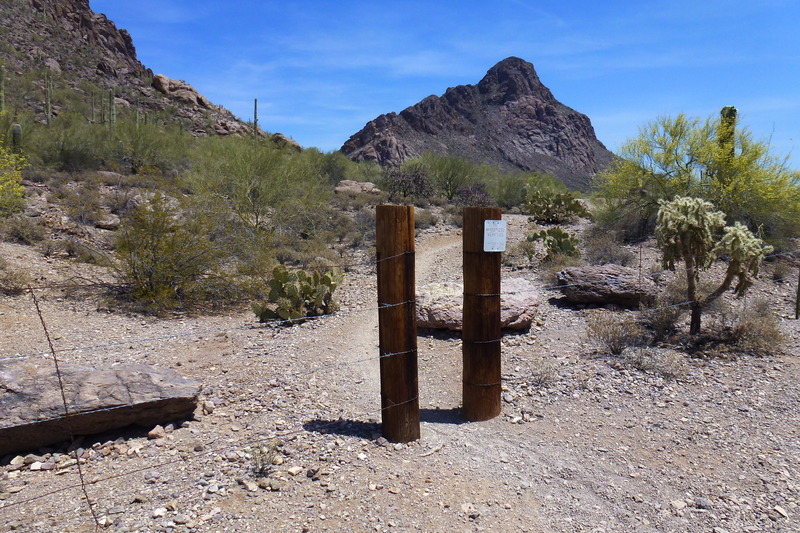 After a few hundred yards there is a gap in the fence and the trail goes through this and towards the valley between Cat and Little Cat Mountains. The trail soon merges with a trail from the right. Continue up to the crest. At the crest an obvious trail heads right then splits at the first sweeping left turn. Take the right hand fork and then make your way uphill. Initially there’s no obvious trail, but but as you get higher the trail becomes clearer. In the upper section there is some rock scrambling up a slab then a gully. Nothing difficult, but definitely a bit more than straightforward hiking. When you get to the top, make a note of where you will be descending otherwise you may have a moment of panic when you can’t find the way down. From the top you have a wonderful view of Golden Gate Mountain to the northwest. While you are here you might as well also hike Little Cat Mountain. There is no real trail up this but you can pick your way up the slopes to the right of the main gully, as shown by the arrow in the photo.